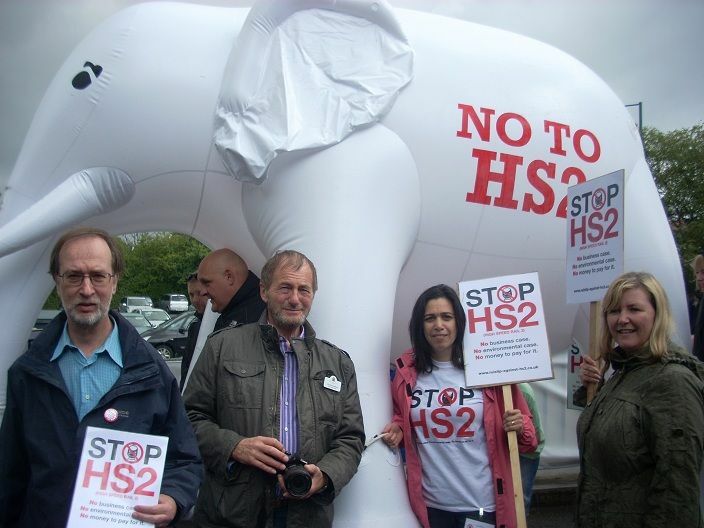 We’ve known for a while that local people are opposed to HS2, the majority of the 4,000 that attended the HS2 roadshow supported our group and signed the Stop HS2 petition, and the Hillingdon Council postcard survey showed 90% of residents are against the proposals. Today we were delighted to see 500 people turn up in the rain to march through Ruislip to show the government their disdain at the £33 billion plans for HS2. 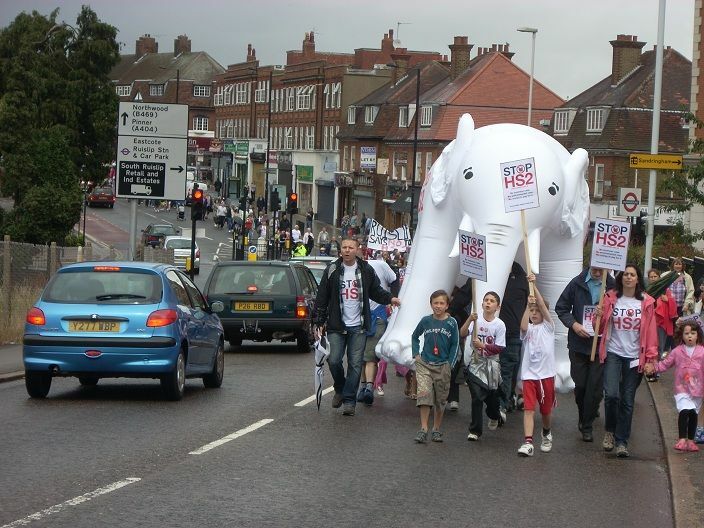 Local people of all ages marched through the town chanting and blowing whistles with an 8 foot white elephant leading the way. Passers by showed their support by beeping their horns. Everyone returned to the rugby club to see the Alternative Roadshow and hear a message from council leader Ray Puddifoot, read by Cllr Douglas Mills. We were also delighted to be joined by HS2 action groups from Perivale, Amersham, Chilterns and a founder of Stop HS2, Joe Rukin. John Randall MP also came along to see us. Sadly the weather was not great but for those who stayed on we had a noise demo of a HS1 train (we used a decibel monitor to ensure we played the appropriate volume) and there was entertainment for the kids. It was a great day all in all, with coverage on BBC London. Our genuine thanks go to Ruislip Rugby Club, our local police, AGHAST, Hillingdon Council, Discoz.com, Frank Partridge and all our wonderful volunteers. This entry was posted in Uncategorized and tagged alternative roadshow, Amersham, Chilterns, community walk, Douglas Mills, Hillingdon Council, Joe Rukin, John Randall, noise demo, Perivale, white elephant. Bookmark the permalink.